When you think about the term “math fluency,” what comes to mind? My guess is that the first thing, and perhaps the only thing, that comes to mind is math fact fluency. After all, it is extremely important that our students know their math facts within 10+10 and 10×10, from memory, before they can find success with higher levels of mathematics, isn’t that right? Most recently, the National Council of Teachers of Mathematics (NCTM) has defined mathematical fluency as accuracy, efficiency, flexibility, and appropriately working with a variety of foundational mathematical ideas. Yes, this includes math facts, and it also includes other math concepts such as quantity, place value, multi-digit operations, fractions, decimals, percents, equations, functions…and the lists goes on. And, of course, as one progresses into higher levels of math, new fluencies become necessary for success. So, yes, math fact fluency is foundational, important, and necessary, but not exclusive. Therefore, today we focus on number sense fluency. 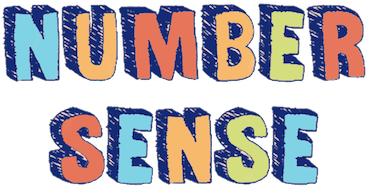 Number sense “refers to a child’s fluidity and flexibility with numbers, the sense of what numbers mean and an ability to perform mental mathematics and to look at the world and make comparisons.” (Gerston & Chard, 1999, quoted in Hornigold, 2017). Number sense develops over time as students engage in activities that facilitate playing with numbers, learning to see relationships within and among numbers and becoming increasingly flexible in the ways in which they think about numbers. And as children develop number sense, they should develop accurate, efficient, flexible, and appropriate ways of thinking about numbers, thus making “number sense fluency” an important building block. Successful math students develop number sense fluency within various number ranges – numbers within 10, 100, and 1,000,000; place value; decimals; fractions; percents; ratios; rational numbers; irrational numbers; and so on. And becoming fluent with number sense concepts continues beyond the early grades as mathematical concepts become increasingly sophisticated. For today, let’s take a look at some practical ways to develop number sense fluency in the elementary years, beginning with numbers within 10 and continuing through fractions. Young children develop a sense of quantity and comparative quantities through a variety of activities. For example, when working with the number “5,” a child might count out 5 objects and then decompose the total into “1 and 4” or “3 and 2.” This task can be made visual by using two colors of tiles, for example, or by placing counters on a ten frame. Speaking of ten frames, the use of ten-frames can help a young child develop a sense of “ten-ness” (a component of number sense). Placing 7 counters on a ten frame, for example, can help him/her see the relationship between 7 and 10: “7 is 3 less than 10”, and “7 is 2 more than 5” are two observations the child might make. A critical factor in understanding number and operations with very small and very large numbers is knowing how numbers are constructed. Finding various ways to compose and decompose whole numbers and decimals, especially around the idea of tens and magnitudes of ten, plays a vital role in building place value understanding. To help make this notion visible, KP Mathematics has created the notion of the “infinite ten frame,” a unique way of helping children solidify place value understanding. Ten frames, primarily used as a structure for helping young children understand relationships among quantities within ten, have been around for decades. With KP Ten-Frame Tiles, students can build “nesting” ten frames that extend the ten-frame representation beyond ten. Students place 10 ones onto a small ten frame. When the small ten frame is filled, they place a cover on top to represent 1 ten. Then, they can collect the tens on a large ten frame. When the large ten frame is filled with 10 tens, they cover to represent 1 hundred. One more iteration creates 1000. At that point, the process continues with drawings. Click here to see a video example. Students can use this same “nesting” process to explore decimal fractions, as well. The large ten frame becomes a unit of “1.” Students lift the cover to view 10 tenths. Then, they remove the tenths-covers to reveal 100 hundredths. This powerful representation does wonders for helping students carry out, visualize and internalize decimal fraction concepts and operations. Students should develop a deep sense of fractions just as they do with whole numbers and decimals. By drawing pictures, placing fractions on number lines, folding and cutting paper, and using mental strategies to decompose fractions, students gain a deeper understanding of what fractions represent. For example, knowing that ¾ is composed of ¼ and ½ helps a child understand that ¾ is greater than ½ and less than 1 whole. Such comparisons support a much more robust sense of number than when students use an equivalent fractions strategy to compare. Knowing that 1/3 is less than ½ and that 3/5 is greater than ½ provides another solid way to compare 1/3 and 3/5 rather than finding common denominators. Knowing that 7/8 is closer to 1 whole than 5/6 because the “missing piece” is smaller provides another line of logic that creates a robust sense of number. As mentioned before, number sense fluency develops over time and requires numerous carefully-crafted opportunities through which students make progress. This post, lengthy as it is, provides only a few examples. Most commercial textbooks neglect to offer the types and quantities of experiences children need in order to develop number sense fluency. We owe it to our students to build the foundations they need for success. What activities have you done to develop number sense at your grade level(s)? What else would you like to know? Please take a moment to share your thoughts in the comments box below.